Adobe® Audition® CC software offers high-performance, intuitive tools for audio editing, mixing, restoration, and effects. Powerful new features such as real-time clip stretching, automatic speech alignment, and control surface support help you deliver projects faster than ever. Create and deliver beautiful audio using more connected tools and dozens of new features, including Sound Remover, which can eliminate unwanted sounds from an entire file just by analyzing a small selection. Adobe® Audition® CC gives you access to new features as soon as they're released and is integrated with other Adobe video tools for smooth start-to-finish audio and video production. Your entire creative world, together in one place. 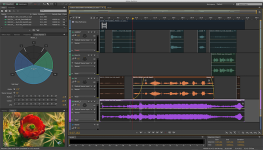 Adobe® Audition CC software offers high-performance, intuitive tools for audio editing, mixing, restoration, and effects. Powerful new features such as real-time clip stretching, automatic speech alignment, and control surface support help you deliver projects faster than ever. 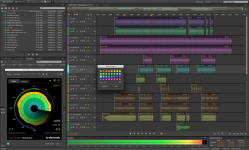 Adobe® Audition® CC is part of Creative Cloud™. That means you have access to all the latest updates and future releases the moment they're available. Sharpen your skills and master new tools with a rich library of training videos. And with Behance® integration, you can share your projects and get immediate feedback from creatives around the world. Easily remove specific audio elements in just a few clicks. Select a sample of the unwanted sound; Sound Remover will scan the entire clip and remove that element from the recording. Repair or restore dialogue and production audio to deliver pristine results faster. Confirm your edits before you commit. With Preview Editor, you can visually compare waveform tweaks, view multiple file sections simultaneously, and confirm time stretching before applying your changes. Clear and comprehensive clip handling, manipulation, and grouping tools save time by letting you craft large multitrack projects quickly, apply edits and effects to multiple clips, and organize audio within projects easily. Adobe Audition includes many new and enhanced sound design tools, including Noise Generator and Pitch Bender, that let you create sounds and shape soundscapes to craft the perfect effect. 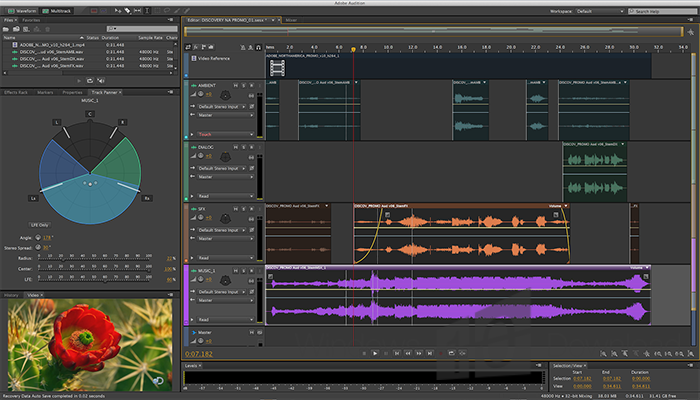 Seamless roundtrip editing on audio tracks lets you send clips, mixes, or sequences from Adobe Premiere® Pro to Adobe Audition and back for editing, restoration, and complete soundtrack creation. Replace location dialogue with studio-recorded ADR and align it perfectly, even if the original audio includes background noise. Fix lip sync issues easily and deliver better production value faster. 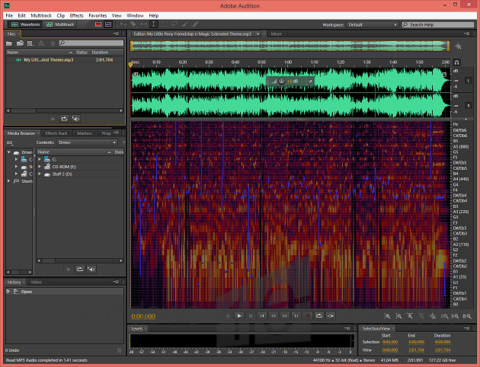 Edit audio with surgical precision using enhanced selection capabilities in the Spectral Display editor. Make multiple selections, create complex regions, and apply more accurate fixes with visual editing tools similar to those in Adobe Photoshop®. Work efficiently with a streamlined interface. Dock panels to emphasize the tools you need most, and use new shortcuts, navigation tools, and timeline views to work smarter and finish faster. Conform to today's broadcast regulations with a loudness monitor you can reference as you work. The ITU Loudness Radar panel provides visual feedback so you can quickly find and fix audio passages that exceed volume limits.